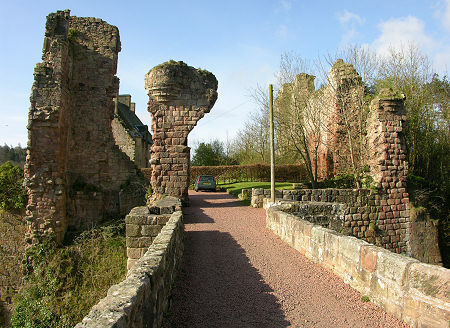 A couple of hundred yards south of Rosslyn Chapel and the village of Roslin is Rosslyn Castle. Yet although the Chapel is world famous, the castle is virtually unknown, even by those who would consider themselves fairly expert on Scotland and its attractions. 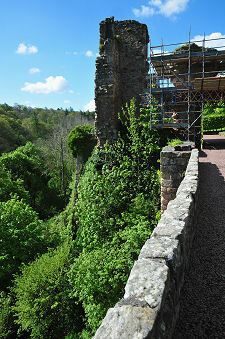 The reason for the castle's relative anonymity is down to visibility. Or the lack of it. Rosslyn Castle is all but invisible from any distance at all in any direction. Most people have simply forgotten that it exists. There are two ways of accessing the castle. The first is via the footpaths and track that descend from Rosslyn Chapel. 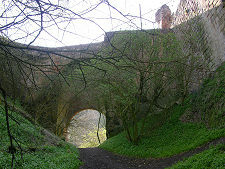 The second is from the car park in Roslin Glen. 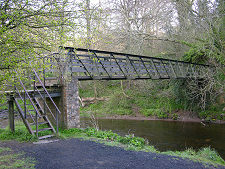 Footpaths lead you over a bridge across the River North Esk and around the west side of a steep wooded promontory. Eventually a set of steps lead you up to the approach road to the castle, close to the bridge that is its only link with the rest of the world. What you find is a remarkable, ruined, almost fairy-tale, castle occupying the high ground of the promontory in what would have been a wonderful defensive site until the invention of cannons made it vulnerable to fire from the all too nearby higher ground. 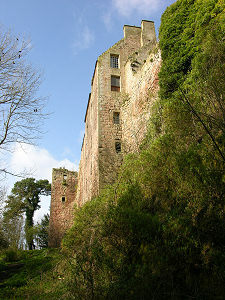 Within the castle is a house built out of its ruins, now available for holiday lets in a location that can justly be described as unique. The views of the castle from the approach, the bridge and the courtyard are striking: yet to appreciate it fully you need to descend from the approach road and pass under the bridge. Here a path takes you down towards the river, and allows you to appreciate the full five storeys or more of structure still standing when viewed from here. 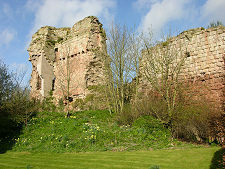 The first stone castle to be built on this site arrived in 1304, when the St Clair family sought to strengthen their hold on their estates in the area. The castle was continuously developed over the following three centuries and frequently repaired following assorted mishaps. These include an accidental fire in 1447 that destroyed much of the building; a non-accidental fire when the castle was attacked by English troops under the Earl of Hertford in 1544; and its final demise as a castle when attacked by Cromwell's troops under General Monck in 1651. By that time the attackers could use cannons sited on higher ground to the north to negate the strength of the castle itself. 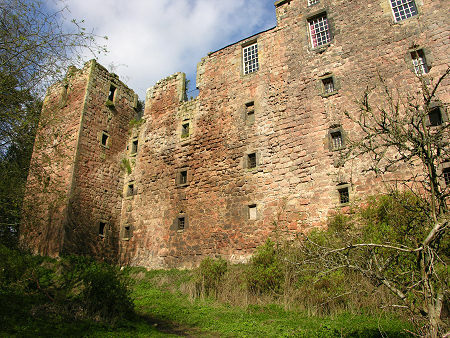 The family built for themselves a mansion within the shell of the structure, occupying the top two storeys of the five available in the east range of the castle. Even this was attacked, by a mob from Edinburgh in 1688 trying to destroy "popery". The house was later repaired. Of course, this wouldn't be Rosslyn if it didn't have its fair share of myths and legends. The castle is said to be home to a sleeping lady who will one day awake and show the whereabouts of a fabulous treasure buried deep within its vaults. When this happens, the castle will again rise from its ruins. 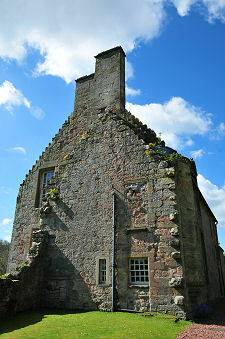 A similar story of treasure surrounds the visit to Rosslyn Castle of a Count Poli from Italy in 1834, allegedly a descendant of the last Provost of Rosslyn Chapel who had been forced to flee to Italy after the Reformation of 1560. It is said that, following instructions written by his ancestor, he discovered the hiding place within the castle vaults of a hoard of manuscripts and books, hidden during the Reformation. It is also said he took many back to Italy with him, including a copy of a Latin history of Scotland from the beginning of the world until 1535, which is now said to be in the Vatican Library.